The big reason why I didn’t knit or blog so much last year was because of work. I would be in NYC just about every other week, so I really got to know the city well. Between that job and the new job sending me out to Cali all the time, I have quite a reserve of points. It really is the only reason to even tolerate traveling that much – free flights, hotel rooms, etc. I have enough points to get me somewhere in the US, but not somewhere like Greece or Italy, where I would rather have a long vacation. Knowing that I would probably not use all these points up before they expire or something like that, I decided that I would use them to my advantage. So, I’m going to NYC for Vogue Knitting Live! I scheduled the classes I am taking, booked my room at Le Parker Méridien (if I’m going to use the points, I’m going to do it with a bit of style), and my flight to NY (with points, of course). I’m actually excited about it. I can’t wait to get into the marketplace and fondle (yes, fondle) all the new yarns I’ve been missing out on this last year or so. 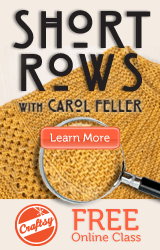 I picked some good classes – Photographing Your Fiber, The Art of Knitting Backwards, and Beyond the Raglan (parts 1 & 2). I haven’t been to real classes in several years, and it’s time to learn something new. Too bad I couldn’t use points for the event itself.